IFNEC and NICE Future co-sponsored the “Challenges and Opportunities Facing Nuclear Energy in an Energy Transitions Context” event on 13-14 Nov in Tokyo at METI. I was honored to participate in this event on the role of government in nuclear power. Governments have and will continue to be a critical factor for nuclear power. Assuming that the market will deliver new nuclear power plants is wishful thinking – nuclear power will only be delivered by private investors with a significant role of government. And nuclear power plant development at the scale needed to help with climate change may only be possible as part of a national program. What works for nuclear power? Figure 1 in my slides showed existing and operational nuclear power plants and new nuclear power plants (i.e., those which have started nuclear construction). The large number of nuclear power plants and the range of countries with nuclear power demonstrates that we know how to do nuclear power. Figure 2 in my slides added merchant nuclear generation (i.e., red stripes). Few existing and new nuclear power plants are merchant generators and (as discussed in more detail below, some of these face financial stress). The merchant nuclear approach may not be working well, even where significant incentives have been provided to merchant nuclear projects. Only a few merchant nuclear generators. All operating nuclear power plants were developed and built by government or regulated utilities. For regulated or government utilities, long-term revenue or cost recovery is virtually certain. In this approach, nuclear power is part of a vertically integrated electric utility generating asset portfolio. These regulated and government utilities make investments in generation assets, spend money on power plant fuel and operation, and make decisions about retiring existing assets. These decisions are based on long-term planning processes focused on ensuring reliable operation while minimizing total costs over the long term. A merchant generator is one that depends upon the market for its revenue (i.e., rather than regulated asset with recovery of costs and a return on investment or a government asset with costs covered by the government). The owner of a merchant generator takes significant risk. A new merchant nuclear project faces significant financial uncertainty due to completion risk. Financial and market risk after commercial operation may also be significant. A few existing nuclear power plants operate as merchant generators in the in UK and USA. All of these existing merchant nuclear plants were originally developed and built by regulated or government utilities, with the transformation into merchant generators coming as a part of electricity industry reform. Only a few new nuclear power plants are being developed as merchant generators. While there are several new nuclear projects that are described as merchant generators, none of these projects has total reliance on the market for revenue. Instead, there are varying degrees of and approaches of government support. In Turkey, the build-own-operate (BOO) projects are developed around power purchase agreements with Turkish government utilities. These power agreements provide revenue certainty during early periods, with the owner expecting additional revenue from power sales into the Turkish bilateral power market for some portion of the plant for some of its life. The Russian merchant nuclear project at Akkuyu is proceeding, while searching for investors. In Finland, the Mankala model used by TVO and Fennovoima is similar to the generation and transmission cooperative model in the US. In this model the power plant company is a cooperative with membership by energy users. The energy user members invest in a share of the nuclear power plant, pay a share of the investments and operating costs, and get a share of the power generated. TVO itself has relatively low risk, but each TVO member who participates in the OL3 project are taking a share of the total risk of the nuclear project. In the UK, the Hinkley Point C project has just started nuclear construction. This project will operate in the UK electricity market, but was provided with a bundle of financial incentives to supported the financial investment. These incentives include a long-term power contract that removes the risk to project revenue from electricity market price fluctuations. While the owner of this project will face some risks (e.g., cost overruns and delays), it is unclear whether this should be considered as a merchant project. In my view, the Hinkley Point C (and the linked Sizewell C) project are proceeding only due to the extraordinarily lucrative power contract and other incentives. Also, these projects are owned by state-owned utilities (i.e., EDF, the French national utility that also owns all operating nuclear power plants in the UK, with CGN, a Chinese national utility as a partner). The Bradwell project, using the new Chinese Hualong One reactor design, is moving forward but may be driven primarily by China’s nuclear power industry export business strategy. A standalone privately-owned merchant nuclear company has a large amount of financial risk during construction due to the potential for cost overruns and construction delays. After commercial operation, a merchant nuclear plant faces market risk. A key market risk is that the revenue from sales of electricity or other products into the market will be lower than an amount needed to provide returns on and of investments, and may even be lower than cash generating cost. A more recent market risk is that market operations may curtail a nuclear power plant output (or subject the plant to negative spot prices) due to a flood of renewable generation with preferential dispatch. Merchant nuclear power plant investments are risky and any private financial assessment using typical discounted cash flow techniques will place little value on much of the 80+ year operating life of a new nuclear power plant. This is because a discounted cash flow analysis using a typical commercial discount rate will show little present value for cash flows that are more than about 30 years in the future. If this cash flow analysis is done prior to investment, the negative cash flows during the 10-year development and construction period will dominate. In the US, several existing merchant nuclear plants have retired early due to financial losses due to low electricity market prices and several more merchant nuclear plants are scheduled to retire early in the next few years. Several new merchant nuclear power plants in the US have received NRC approvals to start construction, but none of these have moved forward. Several other merchant nuclear projects in the US pulled out of the NRC process before approval was granted. A recent announcement indicated that the Japanese-led merchant nuclear project in Turkey at SINOP had been cancelled. Merchant nuclear projects in the UK also face issues. The NuGen project is now closed because no buyer could be found for the project. The Horizon project, using a proven ABWR reactor design, is moving forward, although there have been recent news stories about financial issues. It is too much to think that some market economies can shift to centrally planned economies in order to support the nuclear power industry. It is even difficult to see the electricity industry being nationalized or re-regulated in market economies to support the nuclear power industry. Nuclear power plants are large multi-generational assets that provide significant public good. Like high-voltage transmission lines and interstate highways, this type of asset is typically owned by or regulated by the government. Some countries have a government utility approach or a regulated utility approach that is embedded in what is otherwise a market economy. This includes parts of the US, France South Korea, and other countries. It may be difficult to make a shift to a centrally planned electricity and nuclear power industry – even if this would make nuclear power more feasible – but such a privatization or re-regulation approach has been considered. There is precedent for regulated and government nuclear plants to participate in electricity markets. 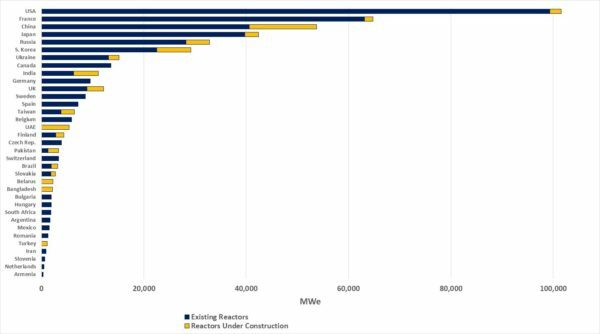 In the US, California, Virginia, and other states retain regulated asset status for nuclear power plants even though these states (and the regulated nuclear power plants) are participating in wholesale electricity markets. The only new nuclear project under construction in the US is in the regulated region of the Southeast. Vogtle, in Georgia, is moving toward completion. V.C. Summer, in South Carolina, was abandoned after starting construction. The regulatory framework for new nuclear in Georgia and South Carolina enabled these nuclear projects to proceed. A new SMR project is being developed in Idaho by NuScale power with a large role of government utilities. A public power cooperative, Utah Associated Municipal Power Systems or UAMPS (a political subdivision of the State of Utah), will be the investor/owner/power offtaker; another public power utility, Energy Northwest, is preparing to act as operator; the US government is providing a site at the Idaho National Laboratory; and the US government is planning to take some of the plant’s output. When the UK privatized British Energy for the first time, British Energy faced financial distress in the electricity market and was re-nationalized a few years later. This is an example for other countries about how to avoid losing the nuclear power industry due to short-run electricity market outcomes. We need to be very careful in how we think about electricity industry reform and electricity markets if we want to keep nuclear as a viable option. A country that has already reformed its electricity industry reform and implemented electricity markets might consider re-regulating or nationalizing merchant nuclear projects, both existing and new, in order to make that merchant nuclear viable. This should be possible without undoing the entire electricity industry approach and without dismantling the electricity markets. Electricity markets are inherently short-term and while these markets do a good job at real-time system and power plant dispatch, the resulting spot prices do not and cannot provide incentives for long-term power plant development and construction. These spot prices may even be too low to allow profitable operation for existing nuclear power plants (e.g., spot prices are below cash generation costs). The basic premise of these electricity markets is to separate generation from the rest of the vertically integrated electricity industry, and then have those generating assets participate as merchant generators in the market. Markets function around short run marginal costs, and generally ignore fixed generating costs returns on investment and other things that are very important to nuclear generating plant owners. Avoiding electricity markets and electricity industry reform may be one way to help nuclear. If a country must reform the electricity sector and must put electricity markets in place, the restructuring approach and the market design can be tailored to avoid adverse financial outcomes for existing nuclear power plants and to ensure that the option of new nuclear power plants is not foreclosed. Japan is restarting its nuclear power industry and projects that a significant portion of national electricity production will come from clean nuclear power. At the same time, Japan is restructuring and reforming the wholesale electricity industry. Japan’s approach to reform the wholesale electricity industry while maintaining a viable nuclear power industry will be closely examined by all countries considering how to reconcile electricity industry reform and nuclear power. If electricity markets are here to stay, there are ways to provide revenue adequacy and certainty to nuclear power. Some argue that electricity market prices can be reformed in a way that will benefit nuclear power, but this is not proven. What is proven is that out-of-market payments can be used to provide additional adequate and certain revenue that can allow nuclear power plants to be financially viable in electricity markets. In response to potential early retirement of existing merchant nuclear plants, some US states implemented programs to pay nuclear power plants more money for the clean air benefits these nuclear power plants provide. These so-called Zero Emissions Credits (ZECs) in New York and Illinois have stopped the early retirement of several nuclear power plants in those states. The ZEC program in New Jersey has been approved and will be implemented in 2019. Connecticut has a clean energy purchase program that may provide similar benefits to nuclear power plants in that state. Absent the ZEC payments, these financially threatened nuclear plants with likely retire early. Similarly, offering power purchase contracts or contracts-for-difference arrangements to a merchant nuclear plant to increase revenue and to make that revenue more certain is another approach. Another approach is to establish clean energy mandates. This would replace the pervasive renewable energy mandates with mandates that include (or even focus on) nuclear power. The same approach used to incentivize renewable energy would be applied to nuclear power. After all, the goal of these programs is to reduce the levels of carbon and other air omissions, and nuclear power is a large source of clean energy. These clean energy mandates would be especially important for nuclear power if the mandates were applied to US government power users and these government power users could enter into long-term contracts with nuclear power plants. A new report by the US DOE provides a detailed view of the incentives provided to renewable energy in the USA. The underlying logic of these renewable incentives is that renewables are clean; renewables face hurdles in the market; and incentives are needed to overcome the resulting market failure. Simply changing these programs to apply to all clean energy sources (i.e., including nuclear power) would provide power incentives for nuclear power and help resolve market failure related to nuclear power. In addition to the out-of-market revenue for clean nuclear energy, it may be possible to reward nuclear power for other valuable attributes of nuclear power plants that may not be reflected in electricity market prices. These attributes might include reliability, long operating life, fuel diversity, low land use, system resilience, and other benefits. Payments for these attributes might help merchant nuclear power plants survive and might even help support investments in new nuclear power projects. If the full cost of electricity is considered, nuclear looks relatively cheap. Another approach is to re-think the approach to the electricity industry by requiring all generating types to cover the full cost of emissions, intermittent operation, use of transmission lines, and other factors. An OECD NEA report on the full costs of electricity discusses this issue. Putting a carbon tax in place to establish a clear price signal related to carbon emissions might be an important factor part of this. However, incorporating the full cost of all generation types in formal bid-based electricity markets may be difficult, given their reliance on short-run marginal costs as the basis of generator bids. Nuclear power projects are among the largest and most complicated projects in the world. But nuclear power is also an essential part of a low-carbon or zero-carbon electricity system, providing a unique mix of clean, reliable, and scalable electricity. Assuming that the market will deliver new nuclear power plants is wishful thinking. Nuclear power will only be delivered by private investors with a significant role of government. Nuclear power plant development at the scale needed to help with climate change may only be possible as part of a national program – the earlier French nuclear power plant program and the current Chinese nuclear plant program are examples. These national nuclear power programs allow in-country nuclear power development on a large scale, and also provide the national nuclear industrial companies with advantages in the global nuclear power market. The excellent “Nuclear in the States Toolkit” prepared by the ANS Special Committee on Nuclear in the States in 2016 has a comprehensive list of actions that could be used to save existing US merchant nuclear plants from early retirement.